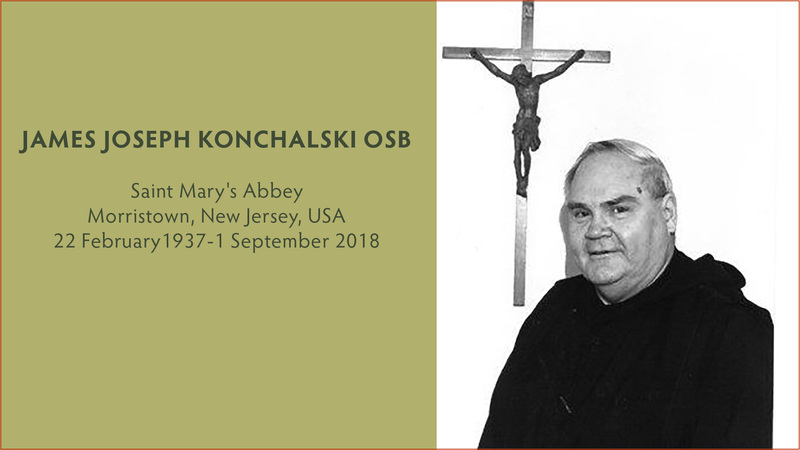 Joseph Ronald Konchalski was born on the fifteenth of February, 1937, in Newark, New Jersey, to Bronislaw and Stella (née Solinski) Konchalski. Mr. Konchalski, a house painter, died when Joseph was nine months old. His mother was a homemaker. Joseph was baptized at St. Casimir Church, Newark, on the twenty-second of February, 1937. He had an older brother, Frank, who worked as a tool and die maker. Joseph graduated from St. Benedict’s Grammar School, Newark, in 1952. That same year, Joseph applied to St. Mary’s Abbey, then located in Newark, as a lay brother candidate. At the age of sixteen, in 1953, James was admitted to the novitiate of St. Mary’s Abbey as a lay brother, assuming the name Brother James. On the eleventh of July, the feast of St. Benedict, in 1954, Br. James professed simple vows In 1958, on the nineteenth of July, Br James professed perpetual vows as a lay brother. Whether assigned to Newark or Morristown, Br. James was engaged in various duties in the monastery, including laundry and cooking. He always had a desire to help others and enjoyed people. In 1968, as a result of the reforms of the Second Vatican Council, Br. James was able to profess solemn vows. He did so on the fifteenth of April, 1968, at St. Mary’s Abbey Church in Morristown. In 1970, Br. James, residing in Morristown after Newark became an independent abbey, requested to transfer his vow of stability to Newark Abbey, where he had spent many fruitful years. In time, however, Br. James desired to return to Morristown, and he formally requested his vow of stability be transferred back to St. Mary’s Abbey from Newark Abbey. On and off throughout the 70s, 80s and 90s, Br. James worked at Delbarton School, in the discipline office and later as a Religious Studies teacher. He was also the housemaster of the dormitory after it closed and became a guesthouse. On the tenth of May, 1980, Br. James was given the privilege of being ordained a permanent deacon. This was a source of great happiness. He later enjoyed fruitful ministry at Notre Dame of Mt. Carmel Parish, Cedar Knolls, then staffed by the monks of St. Mary’s Abbey. There Br. James was most in his element, and fostered the faith of many people, especially the elderly and sick of the parish he would regularly visit. In 2009, Br. James began is last public ministry at Our Lady of Mt. Virgin Parish, Garfield, where he engaged in additional fruitful diaconal ministry, mostly for the sick and elderly of the parish. Ill health meant he had to give this up within a few years. For the last decade of his life, he was the florist for the Abbey Church, till this became increasingly physically demanding. He took pride in his floral arrangements that enhanced the worship space, especially for major feasts and other liturgical celebrations. Br. James died in his new room on the first of September, 2018, in the sixty-fifth year of monastic profession and the thirty-eighth of diaconal ordination. Br. James is survived by his nephew and numerous cousins, and his monastic family.